Welcome to our brand new 2019 website, and hope you like the overall refresh. This year’s show is looking amazing. You will find all the details further down this page, with video clips to help get you excited! NEWS – Ticket Scanning: Just to let you know that we are moving away from manually posting out individual wristband purchases. We have set up a ‘Buy now!‘ secure link to our on-line, low cost, ticket company. They will send you a scan code for each ticket purchased. All you need to do is bring a printed copy of the ticket with ‘scan code’ image to the stewards at the entrance to the park. A tablet or mobile phone image would also be possible if the image is clear. We will scan it and then give you a wristband to acknowledge your entry, and allow you to also re-enter later. NEWS – Park Entry & Exit: Another change we are introducing for safety reasons will be separate vehicle entry and exit gates. 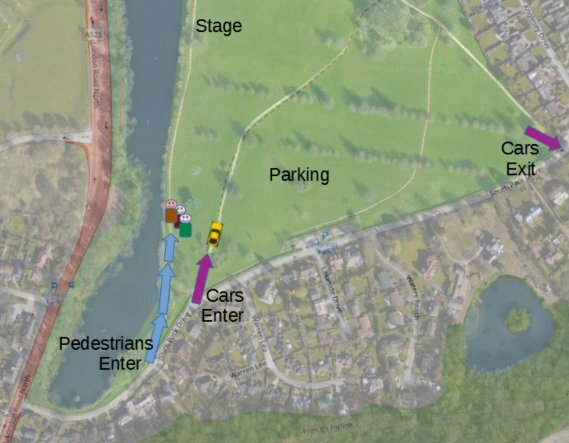 This year you will drive in at the first vehicle gate on South Park Drive (SK12 1BN), and you will exit by the vehicle gate at the top of South Park Drive (See the purple arrows on the layout plan). There is free parking as in previous years within the park. NEWS – Discounts: There will be very significant discounts on the normal price when purchased early. These tickets will have single use scan codes which means after a valid scan you receive the wristband, which must be worn during the event. Alternatively wristbands may be purchased by cash or payment card, at MATES DIY, several weeks before the event right up to the actual day. NEWS – Vendors: To supplement your own party picnic, we have a number of food and drink vendors planned, including a Drinks Bar, The Coffee Pot, Smoothy Truck, Whippy Ice Cream, Spud Van, Wildfire Pizzas, NW Events Fish & Chips, Sugar Donuts. We also have the popular Face Painting tent from last year. We really appreciate the donations made by all these traders. ENTERTAINERS: This year’s charity musical extravaganza will take place on Saturday 15th June 2019 and again offers 6+ hours of sensational live music for all tastes. We start off at 4pm with a showcase of young talent from Poynton, whilst you enjoy your food and drink hampers. This is followed by Poynton’s award winning Vernon Brass Band, who have been with us every year since the event started in 2004. Next we have Paul Grant Reason performing an amazing tribute to George Michael. Back again by popular demand are Monkey Harris who we know will have everybody on their feet dancing. An hour later Paul Grant Reason transforms and loses his bristles in order to perform an incredible award winning tribute act to Robbie Williams. Top of the bill this year are an incredible tribute band called Waterloo. The clue is in the name – they are considered the best ABBA tribute band. Take a look at our YouTube video and see them in action. Last but definitely not least is our very own Leroy Lurve who will compère the whole show. George Michael Tribute act by Paul Grant Reason. His show is a real must for all George Michael fans as he will bring you the passion and energy of George in the 80s and beyond, that made him such a loved, global megastar. Robbie Williams Tibute act by Paul Grant Reason is an amazing act. You are in for a real treat! He has won the National Tribute award three times with the voice, look, mannerisms and stage presence of Robbie to absolute perfection. Just take a look at the video clip and see for yourselves. ABBA Tribute 90 minute act by Waterloo is just like watching the real ABBA back in the day when they were right at the top. Waterloo are deemed to be the very best of ABBA. They are the most authentic ABBA show that you are ever likely to hear. 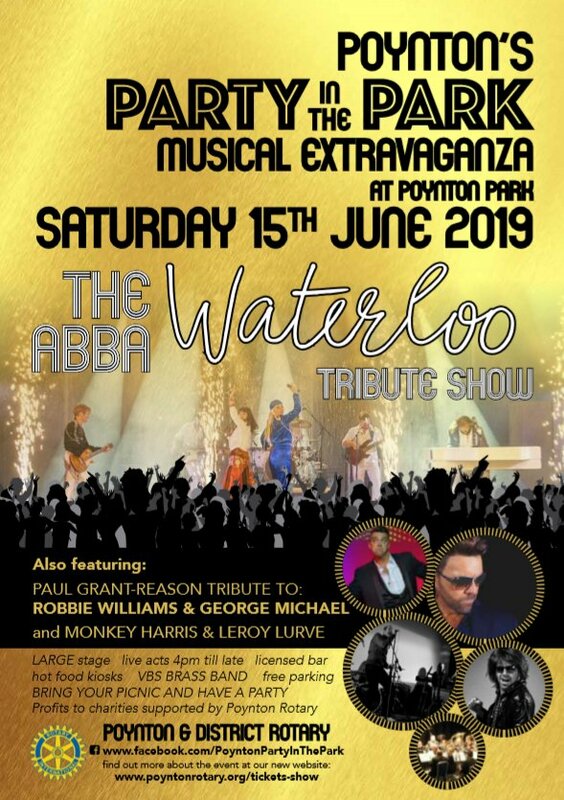 They will be top of the bill at the 2019 Party in the Park event brought to you by Poynton Rotary club. A taster video of Poynton Rotary’s Party in the Park Extravaganza from 2018. You may even spot yourselves in the crowd if you look closely! 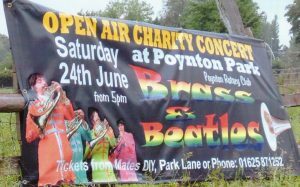 Keep up to date on our Facebook page for Poynton Party In The Park. 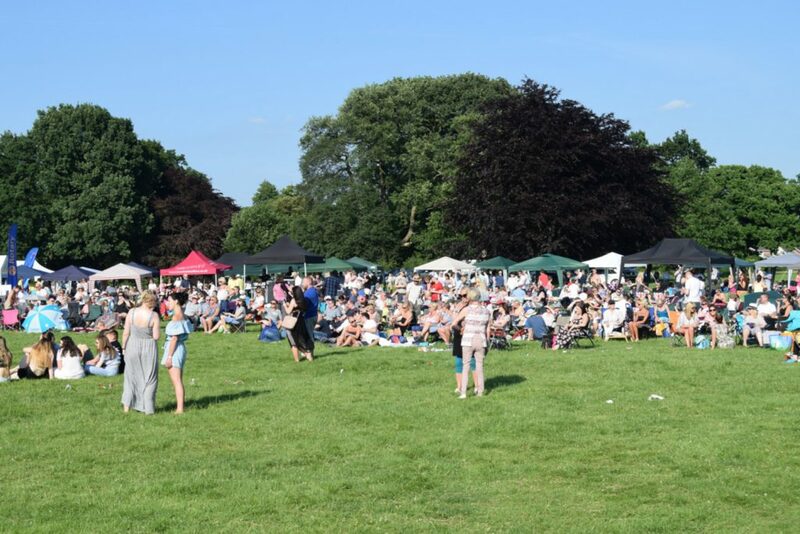 Party In The Park is a ‘not for profit event’ so the good news is that all surplus/profits from the event will go to charities and worthy community causes supported by Poynton and District Rotary Club. The new booking system is not yet open. It should be open early April 2019. Terms & Conditions: Dogs, BBQs, Chinese lanterns & other naked flames are NOT permitted. Those aged 16 and under will be refused entrance unless accompanied by an adult. Extensive security will be in place across the venue and we reserve the right to carry out bag searches. In the interest of health and safety to the public, vehicles will not be allowed in the gazebo area, but may use a designated dropping off area up to 4pm. Vehicles may be left overnight, at the owners risk, providing they are removed before noon on Sunday 16th June. In the unlikely event that the concert has to be cancelled or abandoned no refunds can be made. In addition to generous Sponsorship, there are 3 methods to buy your tickets (see the options below). We recommend for the best discounts, buy your tickets in April or May using option 1 method. Option (1) On-Line: If you are ready to purchase any combination of Adult, Child, or Family tickets, or Gazebo Plots, please click on the green button or ‘Buy now!‘ to transfer to our secure payment site. There are no hidden extra purchase costs to buying your tickets using this system. You will be emailed a special code for each ticket which will then be exchanged for a wrist band on successful scan on entry. It is important that you bring a paper printout or an image of the codes on your electronic device. Option (2) Visit MATES DIY shop, at 2 Park Lane, Poynton and purchase using either Cash or Payment Card from mid-May up to 15th June 2019. You will be given wristbands for each Adult or Child ticket purchase. It will not be possible to purchase a Gazebo plot from Mates DIY. Option (3) Purchase on site. It will be possible on the 15th June 2019 to purchase at the entrance to the park, at the ticket List price. You will be given wristbands for each Adult or Child ticket purchased by payment card only. It will not be possible to purchase a Gazebo plot on the gate, they need to be purchased on-line. Please note there may be some queues at the entrance during busy times, with this option.